One of the 46th Grammy nominations announced this morning was a first for the Oregon Symphony. The orchestra has issued 11 recordings since 1987, all of them with now Laureate Music Director James DePreist. But this is the Symphonys first Grammy nomination. The Oregon Symphony nomination falls in the Classical Field, in the category of Best Instrumental Soloist Performance with Orchestra and is for the recording of Oregon composer Tomas Svobodas Concerto for Marimba and Orchestra conducted by DePreist and featuring Principal Percussion Niel DePonte. Tooze, who funded the recording, approached DePreist and asked him to consider recording Svobodas Marimba Concerto because she said it is a good, solid piece and one you find out more about each time you hear it. She calls it the real star of the all-Svoboda recording, which also features his Overture of the Season and his Symphony No. 1 (of Nature). Of the millions of recordings that are made, to have this one, with unknown music, nominated is marvelous and well-deserved, she said. 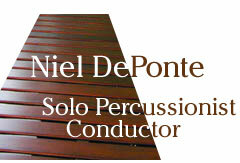 Niel DePonte stood on the lip of the stage in the Arlene Schnitzer Concert Hall, hands flying over the marimba. Like a swashbuckling Errol Flynn battling villains up one staircase and down another, his fists blurred up and down the instrument. The music was not the marimba's usual mellifluous, sun-and-sand sound that takes listeners to blue seas and warm breezes. It had the snap of a Czech folk dance dear to the heart of its composer, Tomas Svoboda. DePonte's performance in Svoboda's Marimba Concerto was startling enough to net DePonte a Grammy nomination after it was released on CD, and if he wins Sunday, he will be the first marimba player ever to win a classical Grammy. DePonte, 50, has been the Oregon Symphony's principal percussionist since 1977. He has performed the piece live on two occasions with conductor James DePreist and the Oregon Symphony. This is DePonte's first Grammy nomination, which also recognizes DePreist, the Oregon Symphony's former music director, as the conductor on the recording. The category is best instrumental soloist performance (with orchestra). DePonte, a well-known percussionist, conductor and arts advocate, faces some stiff competition, including Russian violinist Maxim Vengerov and conductor Mstislav Rostropovich, pianist Mikhail Pletnev, cellist Han-Na Chang and pianist Alan Feinberg. On Thursday, DePonte flew to Los Angeles to take part in the Grammy's pre-awards ceremonies. Neither Svoboda, the internationally known composer, now retired from Portland State University, nor DePreist, the Oregon Symphony's former music director, are joining him, he said. DePonte will stay with other nominees at the Millennium Biltmore Hotel and attend a lunch to salute classical music and a nominees dinner today. The classical music awards pale beside the Grammy Awards televised ceremony recognizing more popular artists such as OutKast and Beyonce. The classical awards take place Sunday afternoon before the televised awards Sunday evening. KOIN (6) will broadcast the three-hour program beginning at 8 p.m.
None of that bothers DePonte. "As always, it's an honor just to be nominated," he said. Niel DePonte's road to the Grammy Awards began 12 years ago. He first discussed the idea of a marimba concerto with Svoboda in 1992, to be premiered during the orchestra's 100th season in 1995. The music offers unusual tonal shadings, a gorgeous chorale backed by a percussion quintet and a brassy quick-step that give way to running notes and leaps for the soloist. Portland philanthropist Mary Tooze funded the recording, which took place in the orchestra's home at the Arlene Schnitzer Concert Hall in January 2000. They sandwiched the recording sessions between live performances of the piece on the orchestra's subscription series. "That was something," DePonte said. "We opened on Saturday night, did a three-hour recording session Sunday morning, performed Sunday night, then a two-hour cadenza session Monday morning, performed Monday night and again in Salem Tuesday night." During the summer of 2000, DePonte edited the recording with engineers in Boston. Svoboda and DePreist signed off on his production work, but the recording sat "in the can" because they didn't have a recording company lined up to print it. Finally, Albany Records agreed to release it in July 2003, which is why it's up for a Grammy this year. DePonte, who joined the Oregon Symphony when he was 24, is also music director and conductor of Oregon Ballet Theatre. But he's equally well-known for encouraging arts education for young people. Each summer, he runs a children's arts camp for kids of diverse backgrounds, and each spring, he leads eight or nine of the region's most talented young musicians in a concert with a professional orchestra in Schnitzer Hall. "No matter what," DePonte said of the Grammys, "Tomas and Mary Tooze deserve so much credit for making the piece and making the recording happen. And DePreist for supporting it." Oregon Symphony principal percussionist Niel DePonte has been nominated for a Grammy Award, the symphony announced Thursday. It is the first time the orchestra or any of its members has been nominated for the prestigious honor. DePonte was nominated in the category of Best Instrumental Soloist Performance with Orchestra for his work in the recording "Orchestral Works by Tomas Svoboda" on Albany Records. He is one of five nominees. "I am completely overwhelmed," DePonte said following the announcement. "I had no idea the recording had been submitted." DePonte, who joined the symphony in 1977 at 24, is also the music director and conductor for Oregon Ballet Theatre. The Grammy is the recording industry's most prestigious award, and is presented annually by the Recording Academy. The nominated 2003 recording was conducted by then musical director James DePreist. Under the leadership of DePreist, now the symphony's laureate music director, the orchestra produced 11 recordings beginning in 1987. "The prestige goes to the orchestra," says Svoboda, who taught music full time at Portland State University for 27 years before retiring in 1984. "This is a great moment for our symphony. "The running joke is that forever more, the name of this organization is 'The Grammy-nominated Oregon Symphony Orchestra,'" says Carrie Kikel, director of public relations for the symphony. "The Grammy acknowledgment is recognized as a mark of great artistic achievement. To be nominated is about as good as it gets." The award ceremony will be held in Los Angeles on Feb. 8. DePonte will next be seen locally conducting OBT's "The Nutcracker," beginning Dec. 11. He next appears with the symphony on Jan. 4. The Oregon Symphony and conductor James DePreist were nominated for their first Grammy award Thursday. DePreist, who is not easily impressed, said the nomination caught him by surprise. Being nominated is about as likely as winning the Oregon Lottery, said DePreist, calling the odds astronomical. Its always a shock, but when you get something like this nomination, its wonderful, he said from his Scottsdale, Ariz., home. The symphony nomination is in the classical field, for Best Instrumental Soloist Performance with Orchestra for Orchestral Works by Tomas Svoboda, conducted by DePreist and featuring Niel DePonte on principal percussion. The London Symphony (two nominations), the Nashville Symphony Orchestra and the Russian National Orchestra also were nominated in the category. DePreist, now laureate music director of the symphony, said he had to fall back on the cliche that just being nominated is an honor. The orchestra has issued 11 recordings since 1987 with DePreist. The performance of Oregon composer Svobodas Concerto for Marimba and Orchestra actually was recorded in January 2000 and June 2000 but just was released in June by Albany Records. The CD is available at classical record stores, priced at $10 to $17. DePreist said he shared credit with DePonte and Mary Tooze of Portland, who funded the recording and suggested the Svoboda piece. The 2004 Grammy ceremony is Feb. 8 in Los Angeles. Although DePreist will be on tour in Japan, DePonte will attend, and both he and DePreist would receive an award if the recording wins. DePreist has at least four more recordings due out with the Oregon Symphony in the coming months. The Grammy would not be the first for Oregon. Salem orchestrator David Metzger shared Grammys for the soundtrack album of the 1999 movie Tarzan and the cast recording of the Broadway production of The Lion King, which opened in 1997. Sprague High School has been honored for its music program three times: as a Grammy Signature School in 1999 and 2001 and as a Gold Recipient in 2000 (the countrys best music program in a public school). PORTLAND -- The Oregon Symphony got its first Grammy nomination Thursday. The Symphony has been nominated for best instrumental soloist performance with orchestra. That recording features percussionist Niel DePonte performing Oregon composer Tomas Svoboda's "Concerto for Marimba and Orchestra." It was conducted by James DePreist. DePonte says he's "in total shock." He joined the Oregon Symphony 26 years ago. Mary Tooze funded the recording and approached DePreist with the idea of doing "Marimba Concerto." She calls the work the real star of the all-Svoboda recording, which also features "Overture of the Season" and "Symphony Number One (of Nature)." Tooze says that the nomination is both marvelous and well-deserved.